Nonprofit organizations are prone to fail. By avoiding common pitfalls a nonprofit can succeed. Some things are unavoidable such as a bad economy, however some pitfalls are easy to avoid and will aid in having a successful nonprofit with a roadmap to succeed. 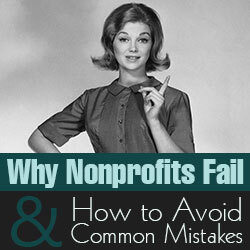 Common mistakes of failing nonprofits fit into the categories below. Not Having a Qualified Leader. No Website Or Poorly Designed Website. Make a user-friendly website, avoid bulky language, make sure the contact information is accessible & accurate. Have strong compelling content. A rule of thumb is make sure nothing is further than “two clicks deep”. Display your mission in a clear area. Have a clear button to donate on every page. No plan of action. A nonprofit is much like a business. There has to be a clear plan to get funding to stay afloat. Nonprofit Doesn’t Mean Tax Exempt. Know your tax laws and file your taxes.